Helps heal and seal your gut, and promotes healthy digestion: The gelatin in bone broth is a hydrophilic colloid. It attracts and holds liquids, including digestive juices, thereby supporting proper digestion. Inhibits infection caused by cold and flu viruses. A study published 10 years ago found that chicken soup indeed has medicinal qualities, significantly mitigating infections. Fights inflammation: Amino acids such as glycine, proline, and arginine all have anti-inflammatory effects. Broth making is a lost art and that’s too bad as our collective health has declined significantly in recent decades. Bone broths and also cultured/fermented foods were health-promoting staples in bygone days and it’s time to resurrect these healthy foods. Bone broth is an excellent addition to children’s diets. It may seem intimidating to make your own broth but it is actually very easy. Once you start doing it, you can easily incorporate it into your weekly routine. For example, every time you cook a whole chicken, toss the carcass and some water into a crockpot that same evening, let it simmer overnight, and voila, you’ll have a gelatin-rich broth that’s ready to be made into soup. You can jazz up your broth by adding other flavorful ingredients like onion, carrot, celery, bay leaf, etc. but just bones and water will work also. It’s important to note, however, that you want to use bones from organic or pastured animals; chickens raised in confined animal feeding operations (CAFOs) tend to produce stock that doesn’t gel, and this gelatin has long been valued for its therapeutic properties. CAFO animals are fed an unnatural diet that is not beneficial for their intestinal makeup, and they’re also given a variety of veterinary drugs and growth promoters. You don’t want any of these potentially harmful additives in your broth. You also want to add some vinegar along with the water. Vinegar helps leech all those valuable minerals from the bones into the water. The goal is to extract as many minerals as possible out of the bones. Raw apple cider vinegar is a good choice as it’s unfiltered and unpasteurized. Start saving your chicken, steak and roast bones to make broth. You can freeze them until you have enough for a batch. Other types of bones work well too such as lamb and pork. You can order organic beef and chicken bones in bulk from Oryana. Also collect the ends and trimmings of vegetables like onions, garlic, carrots, and celery from cooking or juicing and use them instead of the above vegetables. Avoid brassicas (like cauliflower, brussel sprouts, or broccoli) and peelings of squash as they produce an off-flavor in the broth. Place bones in a large stockpot or crockpot. Add water, vinegar and vegetables. Reduce the heat to the lowest setting and let simmer. Let them simmer for about 24 hours. Remove bones from the broth with a slotted spoon and strain the rest through a strainer. Let cool and pour into containers. Refrigerate and use within a week or freeze. Your broth should be gelatinous. The fat will harden at the top and you can skim this off if desired. 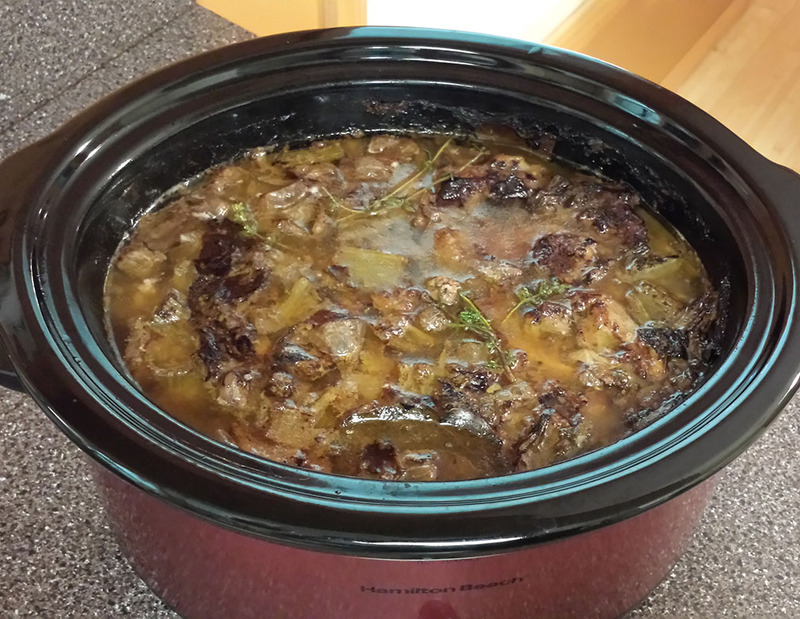 Dump everything in a 6 quart slow cooker and cook on low heat for a minimum of 24 hours but as long as 48 hours. You should have about 4 quarts of broth. Roasting the bones ahead of time will yield a darker brown broth if desired. Transfer the browned bones and vegetables to a large slow cooker. Pour the fat from roasting pan into the cooker. Add 1 cup of water to the pan and cook over medium heat, scraping the bottom of the pan to loosen any browned bits. Pour the water into the slow cooker and add the remaining water to cover. Add the remaining ingredients. Cover and cook on low for 10-12 hours. Skim the scum (impurities) as needed. Let cool slightly. Strain the broth into a bowl and discard the solids. Transfer the broth into quart sized canning jars and let cool to room temperature. Refrigerate until cold. Leave the fat on the broth to help extend its freshness. Use within 1 week or transfer to freezer for up to 6 months. You can use the fat as a stable cooking fat. *Bony bones are marrow bones, knuckle or other joint bones, and neck bones that yield gelatin. Meaty bones are from short ribs, beef shanks, marrow bones with meat on them, or meaty neck bones that provide flavor and color.